Officially adopted in 1889, the Schmidt-Rubin Model 1889 was the result of several years of testing. In 1882 Eduard Rubin began testing the first small-caliber copper-jacketed bullet which could successfully withstand high velocities. In 1885, this round was combined with Rudolf Schmidt's first straight-pull action. The straight-pull action relied upon an actuating rod, set in a channel to the right of the breech, to rotate the bolt though a helical channel cut in the bolt sleeve. Twin locking lugs were positioned midway through the bolt sleeve, locking the bolt into the receiver directly above the trigger. Over the next three years both the rifle design and cartridge were refined. The final result was adopted on June 26, 1889. The Model 1889 was chambered for the 7.5x53.5 round (GP90) with a 213 grain paper patched round producing a velocity of 1935fps. The cartridges were held in a detachable magazine holding 12 rounds. Production ceased in 1897, due to the weakness of the 89s bolt. Approximately 211,890 rifles were produced. Col. Vogelsang’s, along with the assistance of his co-worker Rebholz, changes were fairly simple. In essence, here merely moved the locking lugs from the rear of the bolt sleeve to the front of the bolt sleeve. These changes weren’t quite that simple however, as it required a redesign of the bolt (including the bolt sleeve, firing pin and firing pin spring), receiver, and the stock. Due to turnover amongst Armament Manufacturer Department Heads testing of the new action was delayed until 1895. On 1 January 1895, the test rifles were delivered to the shooting school in Walenstadt. Testing of the new design numerous improvements in performance. It was determined that it would be impractical to attempt to convert the existing Model 1889s to the new action type, thus a new rifle model was required. Thus on July 31, 1896, a new rifle, designated the Model 1889/96 was approved for service. Several minor modifications to the design were made throughout the service life of the rifle. Even before the rifle entered into production the barrel band and firing pin spring was redesigned and the rear of the receiver was widened slightly. Shortly thereafter, the firing pin itself was widened from 3.5 to mm in diameter. Nearly all of the 1889/96 were converted into Model 1896/11 in the 1910s. Of the 137,000 89/96s produced, only 1,280 remained in their original configuration. Sights - Quadrant sight graduated to 400m on the right of the sight and 12000m on the left of the sight. By 1893 the Vetterli Cadet Model 1870 Rifles was in short supply. Consequently it was decided to build a new Cadet Rifle, based on the Model 1889 design. Adopted in 1898, the single shot Model 1897 Cadet Rifles fired a cartridge who with a powder charge that had been reduced by approximately 10% for the smaller stature cadets. The reduced load produced a muzzle velocity of approximately 1670fps, as compared to the standard round which produced a muzzle velocity of approximately 1900fps. In order to accommodate both standard GP90 ammunition and the cadet round, the rear sight has two sets of graduations. The left side of the sight was graduated for the GP 90 cartridge, while the right was graduated for the cadet round. In 1896 it was decided to equip artillery and other rear area troops with rifles. The Model 1893 Carbine had proven to be unsuccessful, so a new design was undertaken. Beginning . on February 27, 1900, the Model 1889/1900 was issued to fortress troops, artillerymen, bicycle troops, balloon companies and communication companies. 18,750 1889/1900s were produced from 1901 to 1911. In 1905, the Model 1905 Calvary Carbine was introduced to replace the older, and unpopular, 1893 Carbines. The 1905 was fully stocked to the muzzle, and had no provisions for mounting a bayonet. The 1905 retained the Model 1893s unique rear sight, The sight essentially has two parts. A fixed sight, set at 200m, and a fold down quadrant sight which was adjustable up to 1500m. The 1905 also mimicked the 1893s sling arrangement by having a slot in the buttstock for attaching a sling. 7,900 were produced between 1905 and 1911. Note: the fixed sight at the front. Note: most 1889/1900s and 1905 were converted to 1911 Carbines between in 1913 and 1920. The converted carbines have serial numbers in the 1-26335 range and are sometime referred to as 00/11s and 05/11s..
Barrel Length - 30.7 inches: 4-groove, RH, concentric rifling, 1 in 10.63"
Other modifications included the removal of the magazine cut-off, improved sights, and an integral rifle rest. While the integral rifle rest was discarded as superfluous, the testing otherwise proved successful.. This led to the authorization of the creation of 900 Rifles and 100 Carbines, for the purposed of testing the new GP08 (later redesignated GP11) cartridge. The 1908 Rifles and Carbines were fitted with Model 1889/1900 style 6 round magazines, and improved sights. The 1908s also had several unique features, not found in other Schmidt-Rubin models. The locking lug sleeve of the 1908’s bolt had three circular holes, presumably for weight savings purposes. 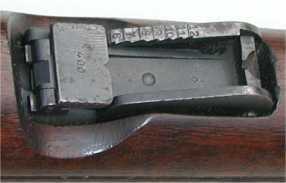 In addition, the relief cuts on the top of 1908s receiver were of different length, with the longer cut set along the center of the receiver, with the shorter cut off to the side. On all other Schmidt-Rubins, the relief cuts were of equal length, and both cuts were equally offset from the centerline of the receiver. By around 1907, the Swiss knew the old GP90 cartridge was inferior to those being adopted by their neighbors. So they started testing a new round. They built the 1908 series for this purpose. The 1908 has some unique feature, not seen in other Schmidt-Rubins, including three holes in the bolt. Testing showed the VGP08 cartridge produced significantly better results than the GP90 cartridge. Consequently, the VGP08 cartridge was adopted as the GP11 cartridge. It was determined that the 89/96 could easily be converted (Model 1889s could not) to handle the new cartridge by re-barreling the rifle. A new barrel was added. Already fitted the the barrel were new front and rear sights. A pistol grip was grafted onto the stock of the rifle. The new rifles were also fitted with 6rd magazines, similar to the 1889/1900 pattern magazine, minus the reinforcing ridge, although the magazine did include a bolt hold-open feature for when the magazine was empty. A new trigger-guard was fitted to accommodate the new magazine. However, it took several years for all the 89/96s to be converted to 96/11 and 1911 Rifle production continued until 1918. Rather than leave large numbers of troops unarmed while the rifles were shipped off for conversion, they were re-issued Model 1889s. (Troops with Model 89/00 Short Rifles and 05 Carbines were re-issued 1893 Carbines). Swiss soldiers are roughly classified into two categories, elite and reserve. Elites are under the age of 30, reserves are over the age of 30. Any trooper reaching reserve status, whom had a 89/96 during the changeover period was issued a Model 1889, and kept it for the remaining term of his service. Raw recruits, were issued Model 1889s as well at this point in time, and were later issued 96/11s or 1911s. The various Canton Arsenals were given different priorities regarding when they were re-equipped. However, I'm not sure what those priorities were. In addition to modernizing their old rifles, in 1913, the Model 1911 was formally adopted. These rifles, along with those converted to the new pattern, fired the new GP11 round. The GP11 round fired a175 grain round at 2640 fps. The 1911 possessed all the improvements listed above. 127,000 1911 Rifles were produced from 1913 to 1919. By the end of the 1920s the Swiss began to question whether or not they should equip their soldiers with rifles or carbines. Indeed, 2/5th of the Infantry and 3/5th of the rest of the army were already equipped with carbines rather than long rifles. While the rifles provide better accuracy and range, the carbines were lighter and easier to handle. 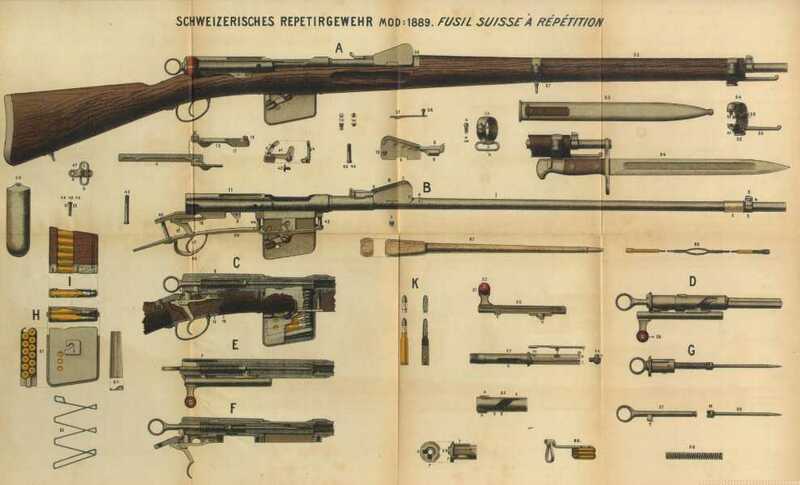 Interestingly enough, while the carbines accuracy was considered adequate for military purposes, it was the member of the various private Swiss shooting clubs that were insisting the more accurate rifle be kept in service. In 1928, first attempt at combining the positive qualities of the rifle and carbine was made by fitting a K11 with a heavy barrel. 200 heavy barreled carbines were produced and tested. However, the gains in accuracy were outweighed by the added cost of the weapon. The decision was made in April 1929 that a new design for the carbine. The new weapon should not be significantly longer than the 1911 Carbine. The new weapon should be cheaper to produce than the 1911 series. Testing began in late 1929 and continued into 1930 of two prototype designs, and end with favorable results. In late 1930 10 new design carbines were sent to the shooting school in Wallenstadt for evaluation. The new design carbine’s accuracy was compared with that of the 1911 Rifle and the heavy barreled carbine. The results of the testing showed the new design carbine to be more accurate than either the rifle or the heavy barrel carbine. However, there were some design issues that needed addressing. The new bolt design was less prone to binding. There were fewer feed problem. The new action was less prone to failure, even in the event of one of the locking lugs breaking. The new stronger action was better able to survive firing with a barrel blockage. The new designs proved very durable, four carbines had 150,000 rounds fired through them without any appreciable failures. Unlike the previous Schmidt-Rubin series of rifles, the new carbine’s locking lug locked up immediately behind the chamber. This afforded several advantages. The entire action was strengthened as the lugs were locking in a much thicker part of the action. Lock-up was also more precise. The bolt was significantly shortened, allowing for a longer barrel and sight radius, without increasing the overall length of the rifle, moving the rear sight closer to the eye, and cutting in half the amount of time for the firing pin to strike the cartridge after the trigger was pulled. The new carbine also had several other new features. The barrel was intended to be free floating. The action itself only connected to the stock by two screws, one attaching to the chamber, with the second attaching to the tang. This allowed the Swiss to eliminate the aluminum barrel collar used in the Schmidt-Rubin series. The trigger was redesigned, as were the magazine and rear sight. The end result of these modifications produced a rifle that was more accurate, yet cheaper than the K11, it was replacing. In 1932 it was estimated that the cost of a K11 would be 169 Swiss Francs. Conversely, the new carbine had an estimated cost of 151 Swiss Francs. On March 17, 1932, the Swiss Upper Parliament accepted the new carbine into service and designated it the Model 1931. During it’s production run there were several minor modifications made to the K31. 1934, the firing pin was made thinner. 1944, due to supply shortages, Chromium Molybdenum was use in place of Chromium Nickel Steel on various parts. This experiment proved unsuccessful. 1946, starting with serial number 868,901, beech rather than walnut was used for making the stocks. The K31 stayed in front line service until 1958, when it was replaced by the Stgw57. K31s were still found with some Swiss Military units, well into the 1970s. The total production run was 528,230 carbines, beginning in 1933 and ceasing in 1958. The Swiss began experimenting with scope rifles in 1918. However, it wasn't until 1940, that they found a satisfactory scope. The Swiss liked the low mounted Kern scope, as it helped keep the shooters head down, thus limiting his exposure to enemy fire. The scope was mounted to the left side of slightly modified K31's. In addition to the optics, a short range (700m) iron sight was mounted on top of the scope. The K31/42 was fitted with a 1.8x sight, while the 31/43 was fitted with an improved 2.8x sight. Both scope had a rather unique periscope arrangement which allowed the Objective of scope to be rotated out of the way, when not in use. However, neither scope proved to have enough magnification or field of vision to be especially useful, and production was ceased shortly after it began. While the ZfK55 possess many visual similarities to the K31, the two rifles only have four parts in common (the cocking piece, the firing pin, the firing pin spring, and the extractor.) The ZfK55 is fitted with a 3.5x scope mounted to the left of the receiver, with the mounts being an integral part of the receiver. The entire action of the ZfK55 is tilted at an angle to allow for ejecting cartridges to clear the scope. The barrel fitted to the ZfK55 is heavier than the one one the K31 and is fitted with a large muzzle-brake/flash suppressor. The ZfK55 also boasts a half-stock with a pistol grip and a bipod.